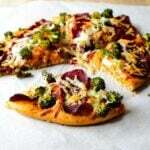 How about making this pizza for dinner today? 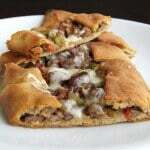 Everyone loves pizza and you can make it in different versions for everyone’s taste. This pepper and mushroom pizza is perfect for those who are vegetarian! Noone in my family is vegetarian, but we love it too! Personally, I find mushroom a little tasteless, but when combined with other ingredients on a well made pizza crust, it becomes heavenly! I’ve made 2 versions of pizza since I learnt how to make a thin and tender pizza crust. See my Homemade Pizza with Cherry Tomatoes and Whole Wheat Pizza with Broccoli (with Yusuf’s secret topping on it) if you haven’t already. You can always create your own topping when you have your favorite pizza crust. 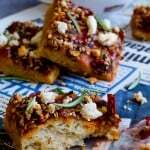 I use whole wheat flour to make these pizzas, and they are still as soft as a crust made with white flour. I used 2 types of pepper –green and red for this mushroom pizza and combined them with a generous amount of grated kasar cheese, which can be replaced by parmesan. The sauce I use under vegetables gives my mushroom pizza a more Mediterranean flavor with garlic, dried thyme and olive oil inside. If you are planning to warm up a family dinner, do it with this mushroom pizza! I’m sure everyone will be happy just as they feel the smell. 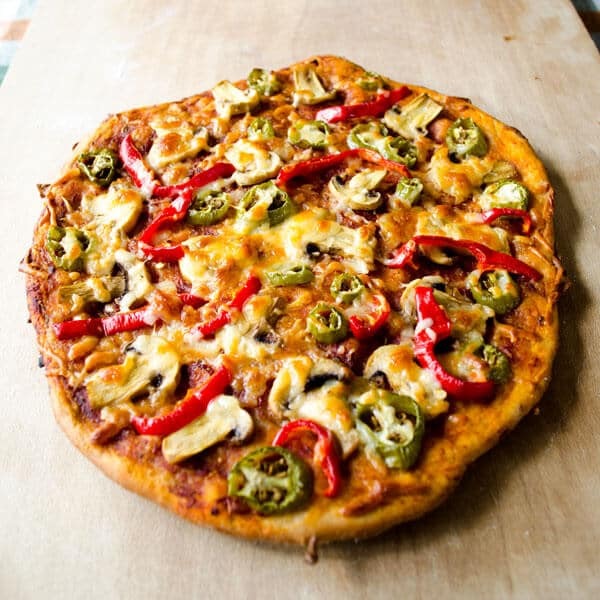 Noone can wait for long to taste this super yummy homemade pizza! A final note about a new way to follow GiveRecipe: See the bloglovin’ icon at the right bottom of the page? You can follow the updates on GiveRecipe from there. What you need to do is just create a free account and click on the icon here! Homemade pizza topped with mushrrom, peppers and cheese. Combine the ingredients for dough very well until you have a non-sticky dough. You can add a little extra flour or water to have the right result. Cover and wait for an hour. Meanwhile prepare the sauce; mix all ingredients well. Roll them out and transfer into an oven tray lined with baking paper. Spread sauce on them with the help of a brush. Place chopped mushroom and peppers on it. Toss grated cheese ove them. Optional: You can take it out, add a little extra cheese, put it back in oven and bake for 5 minutes to have a melting cheese layer on the top. Thank you so much for posting your recipes. The pictures you take are so beautiful. how if I want to make this with white flour,since that’s all I have… how many cup for this recipe? thanks. Hi Mala, you can use the same amount.